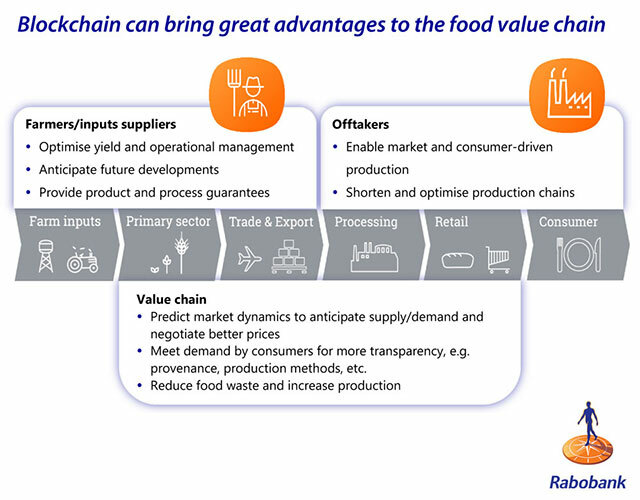 Posted on 8, December 2017 by EuropaWire PR Editors | This entry was posted in Banks, Business, Netherlands, Technology and tagged Blockchain, Food Value Chain, Harry Smit, RaboResearch. Bookmark the permalink. Utrecht, Netherlands, 08-Dec-2017 — /EuropaWire/ — Companies that want to remain successful in the future food value chain should start to explore options for participating in blockchain initiatives in order to help them lower costs, increase efficiencies, offer sustainable products and explore opportunities for creating new value, which are also of benefit to the consumer, according to the latest RaboResearch report ‘Blockchain: The Trigger for Disruption in the Food Value Chain’. Once implemented, the blockchain can be used to reduce costs and/or increase the value of end products or raw materials by using the information that accompanies products. There are opportunities for increasing the added value of raw materials—for example, by meeting specific wishes of consumers related to production method (e.g. fair trade), origin, and other physical and ‘virtual’ quality attributes. “One advantage would, for example, be when tackling food safety issues”, according to Harry Smit, Senior Analyst – Farming and Farm Inputs. “Product recalls can be much easier when the entire chain is transparent.” Transparency of the food chain also means that the benefits of reputation that market leaders have will decline. Trust in a product will become less dependent on the trust in the supplier, but more dependent on the information available in the blockchain. This enables smaller companies to establish premiums based on the intrinsic characteristics of the goods they supply, without necessarily having a longstanding reputation. The available data also creates opportunities for developing products and services based on intelligence. For example, data can be used in predictive models to predict demand and/or success of a product by making use of new insights about correlations and causalities. As a result, business models can change from responsive to risk-based and predictive.